Dan Nixon of OES with one of the machines installed. 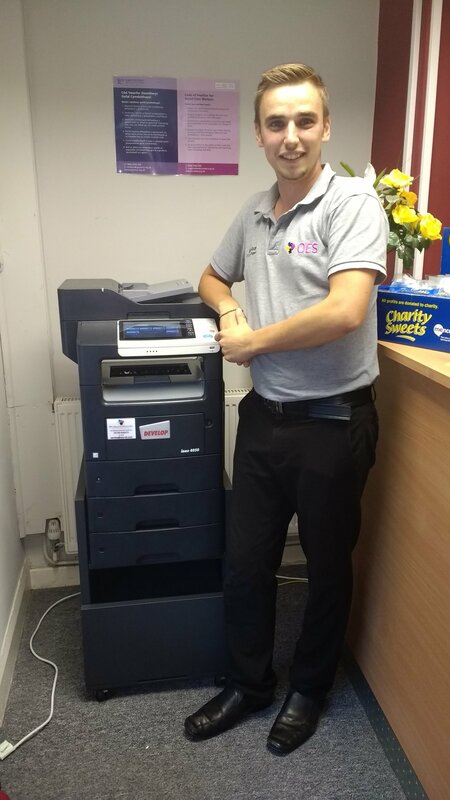 This week we had our latest copiers and printers installed by OES Office Equipment Systems Ltd in Denbigh. 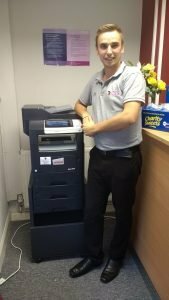 We’ve already run a 3 year contract and were very happy with the quality of their service and the machines. Being local is a bonus too, they can respond quickly in the event of any problems and are always professional and polite. We’d recommend them to any local businesses and wish them every success in their expanding business. 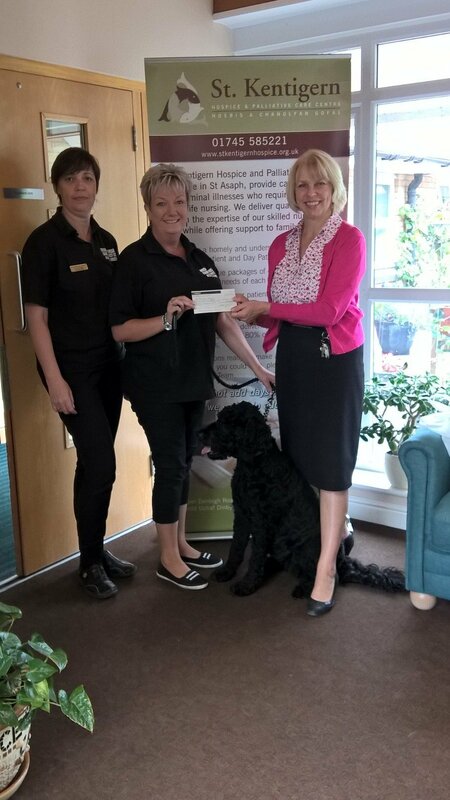 Today our Managing Director (Ms Karen Hughes) and our Quality Representative (Mrs Trish Hughes) took Millie our office dog to visit the team at St Kentigern Hospice in St Asaph. We recently arranged a sponsored Dog Walk to support our local hospice and were pleased today to be able to present them with a cheque for £431.50. We had a lovely day on Sunday 31st July with around 18 dogs on the walk. You can see some of the photo’s here that we took on the day. We’d like to once again thank everyone who took part on the day of the walk, or donated money. On July 31st do something special…. Please support our PUBLIC DOG WALK and bring your dog and family along on 31st July 2016. We are asking for donations of £5 per dog or family (or more if you can) in aid of St Kentigerns Hospice, Registered Charity Number 519931. in St Asaph. Millie our office dog (pictured) is very exited and many of our staff are joining us with their dogs too. Anyone can come along, not just staff or friends of Michael Phillips Care Agency Ltd, if you or your children love dogs, and fancy a short Sunday afternoon walk then come along and bring any spare coins or notes that you have to donate to a very worthy local charity. All dogs must be kept on a lead for the duration of the walk, and everyone must remember to bring their poop bags so we leave all areas clean and tidy. Please tell anyone you know who has a dog about the walk, the more the merrier, we have visions of over 100 dogs walking along together, what a sight that would be and what a collection too in aid of St Kentigern Hospice, Registered Charity Number 519931.. Mark the date on your calendar, July 31st (Sunday) 2.00pm at the Ffrith Car Park. The walk will be from the Ffrith Car Park to Splash Point and back. The collection will be collected in the Car Park before the walk in case you don’t feel up to the entire walk. 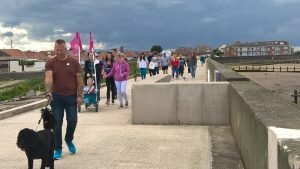 The promenade is pram and wheelchair friendly and is flat. Watch our latest news or facebook page for more information as details become readily available and mark it as a date on your calender. We are looking forward to a fun afternoon no matter what the weather, but it’s forecast to be partly cloudy with sunny intervals and a WNW 13mph breeze. 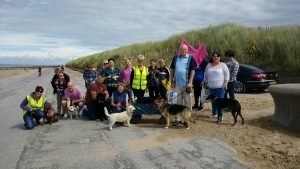 (The Ffrith beach car park will be free on the afternoon of the walk thanks to the team at Ffrith Beach who have facilities and allow dogs into their establishment. Then also have ten pin bowling, snacks and drinks available for purchase) We look forward to seeing you all at the car park from around 1.45pm on Sunday. Back in 2010 we carried out a year of Dignity in Homecare Awareness here at Michael Phillips Care Agency, we were able to use the life history of Gwenda to help us promote dignity awareness in Denbighshire. 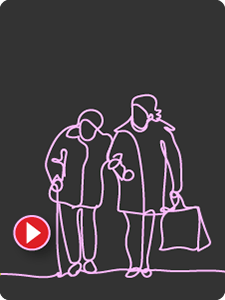 This year, we’ve been speaking to all our client’s and Gwenda who is now 83 years of age, has allowed us once again to add to her experiences by including her responses to our What Matters to Me questions on our website. We ask all our client’s these same questions which are then included in their individual support plans. Since 2010 Gwenda has added to her previous history of ill health. Gwenda has become less mobile having had a number of falls due to vertigo. She now has daily medication to control her dizziness which has helped to enable her to remain living in her own home independently with a little weekly support. Read the questions below to find out what Gwenda has to say in 2016. Life history so that we can understand what matters to Gwenda. Gwenda was born in 1932 in Bangor. She tells us that it was around the time of the depression and that her father was a Greengrocer, but he didn’t have a shop; he used a horse (named Sally after a Gracie Fields song) and cart. 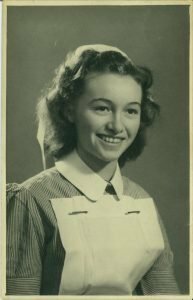 She lived with her family in Birkenhead and her brother and she were evacuated to Ewloe in the War in 1939 because of the bombings. She was in one house and her brother was next-door. Then her brother and her were moved to live with her mother’s sister in Aber , North Wales in the countryside next to the beach and a railway line. The first night there both her and her brother dived under the table because they thought that a passing train rumbling, was a bomb. Her whole family then returned back to Ruthin in Wales and her mother worked in an ammunitions factory. Gwenda later trained as an SRN and she married a Policeman in December 1953. She told us she suffered lots of miscarriages but had two daughters; she had to move around a lot as a policeman’s wife. Her husband passed away in 2001 and she moved to Rhuddlan to be closer to her daughters. We asked Gwenda for a little bit of information about her family, friends and visitors to her home? She told us she has no family left apart from her 2 daughters and 3 grandchildren, her father, mother and two brothers died of heart disease. Her next-door neighbours are very good to her and she has looked after their Budgie in the past. Gwenda sits in the front garden and she has a little cat that comes to visit her for a cuddle. People who are passing by stop and have a chat with her as well which she says is nice. She has a friend called Betty who is 90 and they used to go on Voel coach holidays, but she doesn’t see her that often as she does not drive anymore and Gwenda chose to stop driving when she was 75 due to her slow reactions, but they do both still talk on the telephone. Gwenda told us she loves watching television and she is able to set the recordings for anything that she may miss. She enjoys Emmerdale, Coronation Street, Doctors and she loves films and especially chocolate éclair cakes but she told us she does have to be careful with her diet. She enjoys painting and writing about her life story and her time whilst she was nursing especially. She used to get patients cutting up pieces of gauze, which then could be re-used as they were sterilised back then, not like today. She told us she used to use rubber gloves and they were glued so they could re-use them as well. Gwenda also enjoys going into the garden and feeding the birds. We’ve omitted some privacy content as discussed with Gwenda before publication on our facebook page and website. The interview with Gwenda was held on 3rd June 2016 in the presence of her daughter. May I take this opportunity to say Thank You for the care and support your staff provided to Ann and me throughout Ann’s illness. They were all exceptional, especially Tina. Because she visited the most, Ann formed a closer relationship. The care provided ensured Ann was comfortable up to the end and I will be forever grateful. Express our thanks for the care…. On behalf of my Mother (N) and our family, I am writing to express our thanks for the care you gave her over a 10 month period prior to her move to a care home on December 4th 2015. We found you staff to be professional and very understanding towards both the needs of (N) and our family. Nothing was too much troule and we were kept informed of how things were progressing and if there were any concerns. (N) developed positive relationships with all staff from your agency but particularly with her regular carer Tina, who she misses and often speaks fondly of. Without your help, support and dedication we would not have been able to keep (N) at home as long as we did. A Big thank you to you and your staff for helping me with my husband WW. and all of them, they are so kind. Thank you (DW) – wife. On behalf of my mother…. March 4th 2016. On behalf of my mother (NS) and our family, I a writing to express our thanks for the care you gave to her over a ten month period prior to her move into Residential Care. We found your staff to be both professional and very understanding towards both the needs on (NS) and our family. Nothing was too much trouble and we were kept informed of how things were progressing and if there were any concerns. 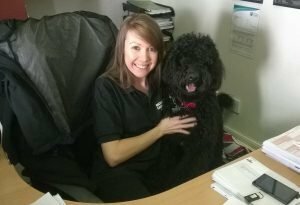 Nellie developed positive relationships with all staff from your agency but particularly with her regular carer Tina, who she misses and often speaks fondly of. Without your help, support and dedication we would not have been able to keep (NS) at home as long as we did. 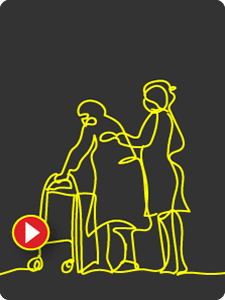 If you work in social care and want to keep up-to-date with all the latest developments and you want to find out what it means to you then follow this link to find out more about the implications of the new act. 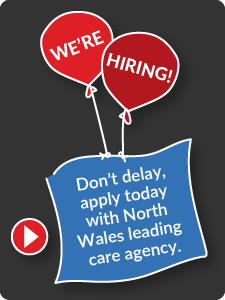 Today feels like any other day for Michael Phillips Care Agency Ltd, but for me it’s a bit of a milestone. My journey here began on 31st January 2001 after having completed 2 weeks working with the help of “Scope” and then, with 16 hours a week I was taken on helping out in the office and providing home care in my local community. Like many of our current care staff and those we’ve employed over the years, as a single parent, I juggled the needs of my home life and young family with the needs of my clients and the business, but always enjoyed feeling that I’d made a difference to someone’s day, every day, no matter how small that difference might have been. I’ve developed the business over the last 15 years and our success is purely due to the united vision and flexibility of all those who’ve moved forwards with me over the years. I believe in high standards, working to improve the lives of not just our clients, but all of our valued employees. I realise that without them, there would be no Michael Phillips Care Agency Ltd, not just the current employees, but those we’ve improved through training and development and seen go on to new adventures with the confidence they’ve gained whilst with us. I’ve been fortunate to make many friends over the years, both business and colleagues and I’m hoping to make many more over the next 15 years.